Leonardo Leo was a prominent Neapolitan composer of the late Baroque. During his lifetime, he was known as one of the great opera composers, in addition to being an important teacher. However, today he's known mainly for the few instrumental works that he composed, where none has been recorded more than this set of 6 cello concertos. Leo was born in San Vito degli Schiavoni (now San Vito dei Normanni), and he went to Naples at the young age of 15, where he studied at the San Maria della Pietà dei Turchini conservatory. Upon finishing his studies, he immediately was appointed the organist to the viceroy's chapel and the maestro di cappella of other Neapolitan aristocrats. He published his first opera at 20, and starting 1720, commissions for his operas never ceased. The commissions not only came from his home town, but other Italian towns (Milan and Bologna) and countries (Spain). Even though his dominance of the serious opera genre was momentarily threatened by Hasse and Vinci, the departure of the former and the death of latter propelled Leo back to the leading musical figure of Naples. Later, Leo ventured into oratorios, which further cemented his reputation. Besides composing, Leo was also one of the most respected teachers in Naples, holding teaching posts at 2 of the 4 main conservatories in Naples. Francesco Durante was the other leading music instructor, teaching at the other 2 conservatories. Thus, a fierce rivalry started between the supporters of the Leo school (called the Leisti) and those of Durante (the Durantisi). The supporters of the former championed the methodical approach of counterpoint, whereas those of the latter emphasized a more natural and instinctive approach, allowing melody to flow freely. Therefore, one might be inclined to think that Leo was old-fashioned and was not capable of writing beautiful melodies. Nothing could be further from the truth, as Leo had the natural gift for melody, and counterpoint only provided a more solid ground for the music to be built on top of. These 6 cello concertos were written for Domenico Marzio Caraffa, the Duke of Maddaloni, between 1737 and 1738. He was a music-loving aristocrat and an amateur cellist, whom Pergolesi also wrote a cello sinfonia (sonata) for. The sixth concerto has the formal title of Sinfonia concertata, a title which is associated most with the early Classical period. While I cannot be positive that Leo was the first to use this term, he must have been among the earliest. Of the six concertos, 3 are written in major scale and 3 are written in the minor scale. Besides the 2nd concerto, which contains 5 movements, the rest follow a four-movement, "slow - fast - slow - fast" sonata da chiesa design. Ironically then, it is the style of the music itself that makes Leo's concertos so surprising. While it's true that he throws in a few fugal movements, and some of his slow movements are reminiscent of Vivaldi, many other parts may have you fooled into thinking it was a contemporary of Haydn. Through these concertos then, one can truly appreciate how avant-garde Leo was for his time. Unfortunately, the early classical era is one of my least favorite musical periods (at the time of writing), and as revolutionary as Leo was, I cannot say that I obtain as much personal gratification from these pieces. From a historical perspective though, it's always interesting to study the music of composers in the transitional period. It is as if they were torn between two big forces, evidence of the forever-changing music landscape. Tafelmusik and Bylsma are well-established in the world of period performances. Tafelmusik was founded in 1979, representing the generation of the 80s where period performance practices were really beginning to take off. Their playing is characterized by their precise intonation and solid performance, sometimes on the careful side, more in line with the British groups such as the English Concert and Academy of Ancient Music. They sound more convincing for the later Baroque concertos and early Classical pieces, where the right balance is struck between their period gestures, ensemble playing, and music style. For the mid-Baroque pieces, their playing is a little too rigid which lacks the spontaneity needed to make the music more engaging. Leo's music falls into the category where they do a decent job in supporting the soloist. Anner Bylsma is one of the pioneers of the Baroque cello, even honored by some as the "Rostropovich of the Baroque cello." He was the first musician to record all Bach cello suites on the Baroque cello, and he did that twice too. His playing is consciously articulate to avoid slurs that occupy the modern cellist. His intonation is also decidedly lighter, much like the bow lightly hugging and caressing the string. This is a big leap for those used to the lush and powerful sound of the modern cello. After all, the cello's full Italian name was the violoncello, or the "small violone." Belonging to an older generation, Bylsma also does not push the music as much as the younger Baroque cellists say, Ophelie Gaillard, or Bruno Cocset (who incidentally took masterclasses with Bylsma). It is a reading where the music-making is effortless yet well thought-out. 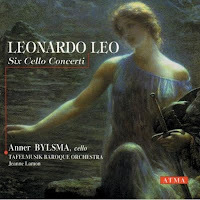 In short, this disc is a good solid partnership and recording of Leo's cello concertos. If late Baroque and early Classical is your thing, surely not to be missed. Thanks for including the samples. Not too excited by this one. Performances don't dance enough for me, and the acoustics are a tad too live. The cello really was a young instrument, and that makes Vivaldi, Tartini, and Leo the earliest composers that wrote cello concertos, Leo's idiom definitely more forward-looking.